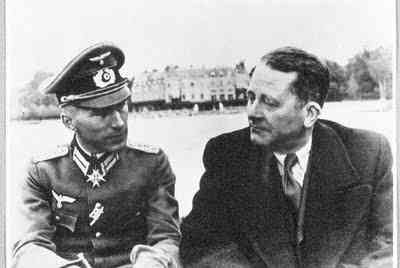 Carl Schmitt, pictured to the right, was a German jurist and political theorist. Schmitt was strongly tied to Nazism, and has been called the "crown jurist of of the Third Reich." In an article published on the Opinion Pages of The New York Times on July 22, 2016, Feisal G. Mohamed, a professor in the Graduate Center of the City College of New York, linked the campaign of Republican Presidential candidate Donald Trump to the philosophy espoused by Carl Schmitt. Hillary Clinton's campaign was said, by Mohamed, to evidence the influence of Hannah Arendt. Somehow, I missed the article in the original, but I was alerted to it by a reference in Amor Mundi, the periodic blog of The Hannah Arendt Center at Bard College. Is a statement meant to be descriptive, rather than prescriptive: The friend-enemy distinction is central to politics in the same way that a good-evil distinction is central to ethics and a beautiful-ugly distinction is central to aesthetics. All other considerations are peripheral to this core concern. Politics, as practiced, does often seem to be a struggle between "friend" and "enemy," with that friend-enemy distinction indeed being a central and core focus of what politics is all about. That fundamental idea, that politics is essentially and inevitably a contest between "friends" and "enemies," is an idea I want to challenge, but the fact that this is such a common way to think about politics leads to various appeals for some other approach, like the appeal I cited yesterday, with the Presbyterian pastor from San Francisco urging "empathy" as a winning political strategy. According to Mohamed, the Trump-Schmitt way of depicting politics lends itself to "tribalism," and to the kind of policy proposals that oppose "our" nation to others, which are seen as "enemies" seeking to besiege us. Trump's proposed "Great Wall," of course, is a prototypical example of just such a policy, dictated by a "friends versus enemies" concept of what politics is all about. Clinton is ... clearly ... more statist than Trump, and in fact it is difficult to discern in her rhetoric a sense of nationhood standing apart from state institutions and policies — this is a major source of her emotional deficit as a politician. Hers is a politics of the achievable, of incremental progress within received institutional bounds, trained by the kind of long experience that breeds familiarity with the workings of government ... Statism inherently favors moneyed interests. Without some sort of pressure from the sphere of political action, the levers of the state fall all too readily into the hands of the wealthy and well connected. For Arendt this leads to a politics where Enlightenment principles like justice and equality are hollowed of significance and used only to advance the agenda of the powerful. Many of those who supported Bernie Sanders over Clinton in the Democratic Party's presidential primary did so precisely because Clinton's approach to politics, while better than the "friends versus enemies" model espoused by Trump, was a politics in which power is really only legitimately available to the "establishment," and in which the moneyed elites get to decide what "justice' and "equality' are all about. This is not, emphatically, how Arendt thought politics should be conceptualized. Arendt emphasize[s] a political space for the kind of human creativity that has positive civic effect. This she likens to the human capacity for procreation: Just as we have the power to bring new human beings into the world, so also we have the power to bring new ideas into the world that reshape their environment, having ripple effects of responses that are also new. This is our highest calling, and highest achievement, as social and political beings. Making something "new" appear, amidst the society that we create, is the true task of politics. This task is not accomplished by a band of "friends" who overcome the opposition of "enemies," whether foreign or domestic. In fact, this "friend-enemy" distinction is counter to the basic concept of politics, which is that we are "all in this together," and that our politics is the way that we, as a community, decide what we should do, and then seek ways to do it. We are, in fact, to use the Hillary Clinton campaign slogan, "stronger together," but that slogan seems to emphasize that our "togetherness" is driven by a kind of pragmatism. We get "together" so we can be "stronger." I propose another idea. I think we need to realize that we ARE together, in sickness and in health, in times of abundance and in times of crisis. We are not divided; we are one. And out of that "many," the "one" makes itself visible. Politics is not, basically, about a friends versus enemies conflict; it is about "decision." Politics is a "friendly debate" about what we should do, and when the time for decision comes, we choose. Our many voices combine. Jesse Jackson called it a "rainbow." I think he may have called it a "tapestry," too. Or maybe that was a metaphor from Dr. Martin Luther King, Jr.